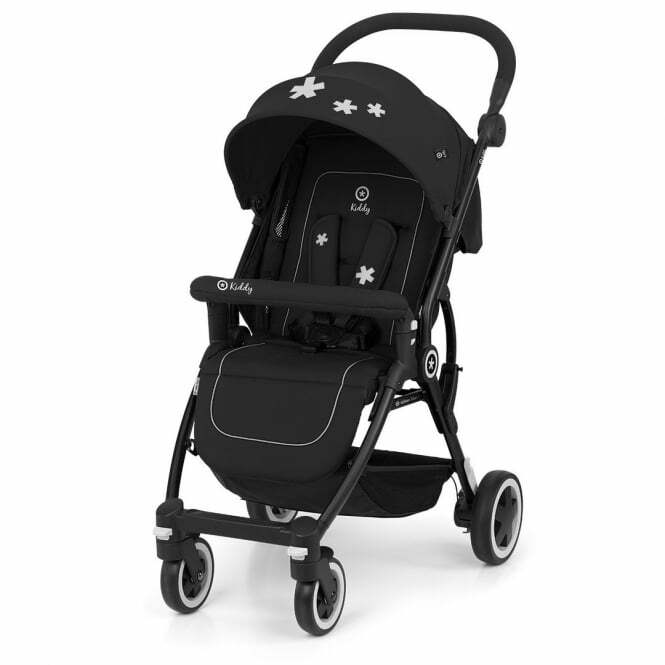 Kiddy Urban Star 1 Pushchair is a completely stress free pushchair. Suitable right from the word go, this all round pushchair will take your child up to approximately 3 years old. Why should I choose the Kiddy Urban Star 1 Pushchair? The Kiddy Urban Star 1 Pushchair is an all round pushchair that is suitable from birth to 15kg (approx. 3 years old). For your tiny weeny baby, you can effortlessly adjust the backrest and leg rest to a lie-flat position. In just two simple steps, your Kiddy Pushchair can be folded into a compact little parcel. Plus, it is freestanding when folded- Brilliant if you run out of hands whilst opening your boot. This pushchair is a fantastic travelling companion for when you're nipping around! As well as this, the Kiddy Urban Star 1 Pushchair comes equipped with particularly robust tyres made from PU which is much sturdier than standard tyres. You will love how long-lasting these tyres are, as the surface hardly wears down even after a lot of use! As well as this, the front swivel wheels are lockable and puncture proof. All of this means that this pushchair is the perfect city companion. This all round pushchair sports a stylish design with unique Kiddy stars decorating the fabrics, making it really stand out from the crowd. The soft fabrics ensure the optimal comfort for your little one. What's more, the backrest can be adjusted with only one hand from upright to reclined, making your life easier. The sun canopy has 4 different extendable positions, and can also be adjusted in height - what a catch! This feature provides maximum flexibility for sun protection for your kiddo. Plus, it's equipped with a 2-height positions harness system with soft padded shoulder and waist straps. These are all washable at 30 degrees Celsius, too. What are the specifications for the Kiddy Urban Star 1 Pushchair? Care: Hand Wash only - seat cover, belts, belt covers, sun canopy. Machine washable 30 degrees Celsius - shopping basket. Do not iron. Is there a Manufacturer's Warranty included with the Kiddy Urban Star 1 Pushchair? Kiddy offer a 2 year Manufacturer's Warranty from the initial date of purchase. If you register your product with Kiddy within 3 months of purchase, this warranty is extended to 3 years. This applies to UK Mainland only.